This project will develop a hub for community growing, training and skills development through the Horticulture Centre and growing sites in Wythenshawe Walled Garden. There is also potential to develop a social enterprise ‘box scheme’ to supply residents with local fruit and vegetables. 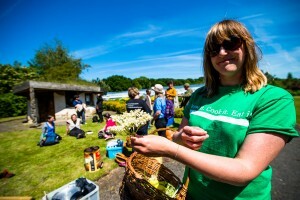 Real Food Wythenshawe has a classroom at Wythenshawe Park and is running numerous workshops, supporting local residents with everything they need to know about growing, cooking and eating sustainably. The team has worked alongside the community farm to re-launch the shop, stocking local fruit and vegetables, Wythenshawe honey, rosehip syrup and award-winning Wythenshawe sausages. In the future the shop will be a distribution point for produce grown in the Walled Garden and Horticulture Centre. Real Food Volunteers have been involved with running the farm shop, supporting growing in the walled garden and with delivering workshops.